The Radio Association of Western New York (RAWNY) is celebrating 100 years as a continuously operating Amateur Radio Club. The club actually formed earlier than 1917 as the Radio Association of Buffalo, but in February of 1917, the club changed its name to the Radio Association of Western New York when it was determined that club members were coming to meetings from suburban locations such as Niagara Falls, Dunkirk, Jamestown, and even Erie, Pennsylvania. RAWNY is perhaps the second oldest Amateur Radio club in the United States after the Radio Club of Hartford (Connecticut) which was the earliest predecessor of the American Radio Relay League. 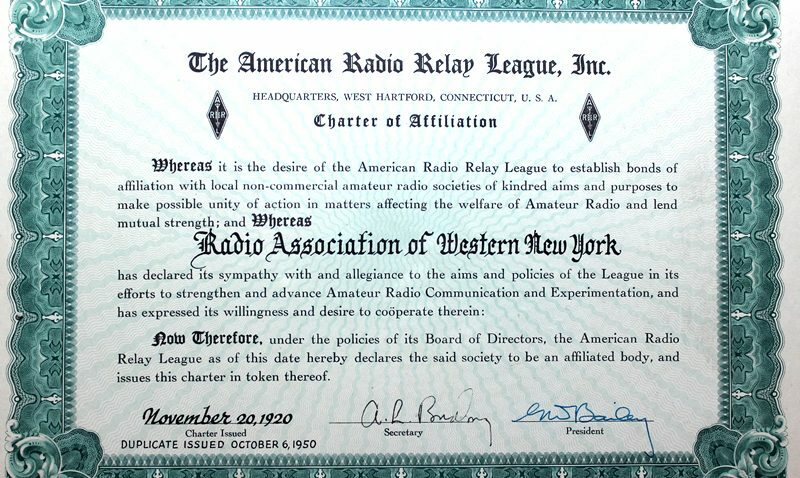 RAWNY (W2PE) is proud of the fact that we have had over 95 years of American Radio Relay League affiliation. We are in the Western NY Section of the ARRL‘s Atlantic Division. The ARRL is a non-commercial, national association of radio amateurs. We have been associated since November 20, 1920. RAWNY was awarded the “Distinguished Service Award” by the Atlantic Division of the ARRL in recognition of significant contributions to the division and the amateur radio community. We are a general interest club currently with 66 members, and we support and encourage all aspects of amateur radio. Our meeting programs cover everything from antennas to power supplies; home brewing to ham radio operating practices. We also host our annual Ham Radio and Technology Fair where we demonstrate many facets of the hobby to our younger generation. You do not have to be a licensed radio amateur to be a member; just have an interest in radio communications. Please join us on the 2nd Tuesday of each month (September through May) if you are in the area or wish to become a member of RAWNY. General meetings are held at the Church of the Nativity, 1530 Colvin Blvd., Tonawanda, NY. Follow this link for directions to the church. If you are in the Western New York area, please tune in to the RAWNY Information Net which meets every Monday at 7pm on the 146.910(-) (also linked with 444.000(+) BARRA repeater system. During the summer months, our activities shift to the USS Little Rock at the Buffalo and Erie County Naval & Military Park in downtown Buffalo, New York. There, we have a club HF station on the public tour route demonstrating the hobby to the park visitors. WE’D LIKE TO HAVE YOU JOIN US! RAWNY would like to remember their friend Mac Willard (KA2EXI), who passed away on October 20, 2018. 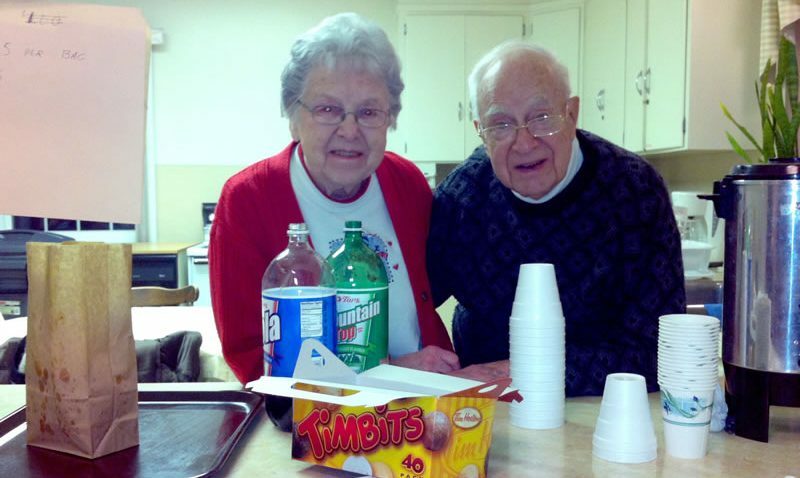 Click on the picture of Mac and his wife Norma to view the tribute page for our dear friend. What's important here is the K-Index, typically 0-9, and the SFI (Solar Flux Index), typically 50-300. The lower the K, the quieter the atmosphere and the ham bands! However, the lower the SFI, the lower the MUF or Maximum Usable Frequency. So, if for example, if you have a K of 1, nice and quiet, you might have a SFI of 50 which would mean that 20 meters might not be usable... The 'Calculated Conditions' section, above, summarizes this data and gives you a snapshot of what the band conditions should be when you are tuning around. Copyright © 2019 Radio Association of Western New York. All Rights Reserved. The Magazine Basic Theme by bavotasan.com.